It is a slow process, changing ingrained thought patterns. Even when you think you know something, it may not be fully grasped, comprehended, internalized, for a while. This grand adventure, as I sometimes call it, this pilgrimage to find my true self, is also a crucible, burning away unhealthy habits of thought. It is also a hospital, healing the many wounds inflicted while going through this world. And it is a classroom, teaching me what is really important and not merely important-looking or attention-grabbing. For a long time, I’ve not had much of a schedule, and what little there has been was largely self-imposed: telling a friend I would arrive around such and such a date, wanting to visit so-and-so before the winter, to make it to this or that town by the end of the day, that sort of thing. So I have technically had a ridiculous amount of freedom to come and go as I choose, but am only very gradually developing the mental freedom to put that into action. Because old habits are hard to let go of: habits of efficiency above all else, of always going forward and not turning around, of making a good plan and sticking to it, and others that can be good in moderation but are the opposite of helpful when taken to an extreme. Case in point. 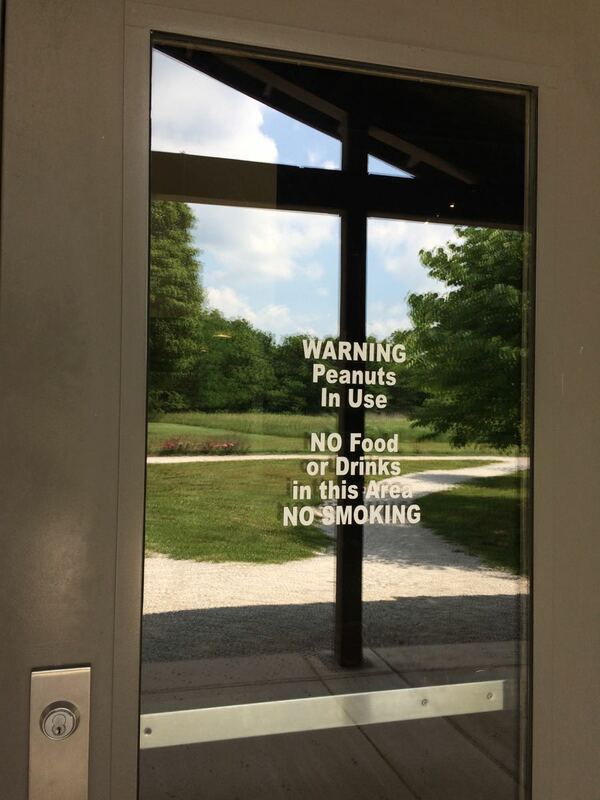 I know that I can make an unplanned detour anytime if I see a sign for something that interests me. In fact, this is one of the things that I have been looking forward to most about traveling without a schedule. But I have not yet done so. Sure, I’ve changed plans sometimes, and given myself permission to not go as far today as I had originally intended, and stayed longer somewhere just because I liked it there, and those were all good and necessary steps to actually just seeing a sign and going there. That turning point, excuse the pun, finally came today. 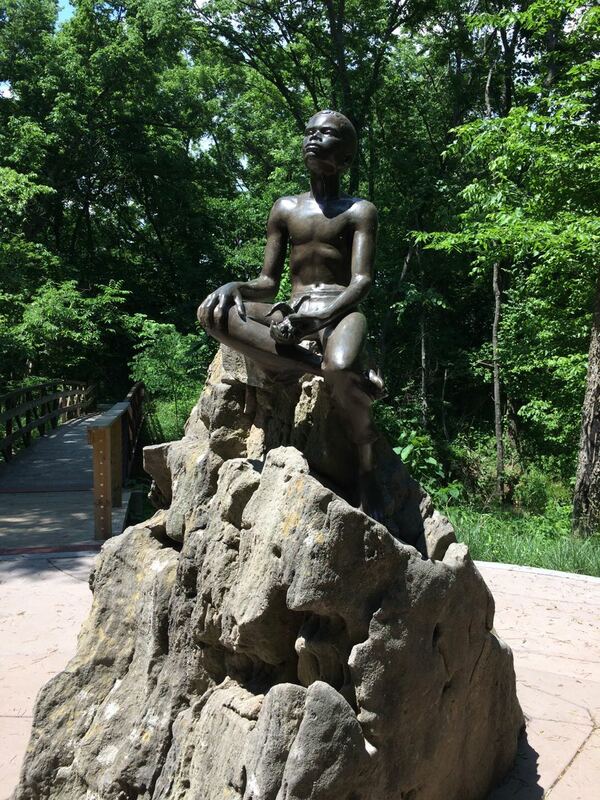 As I drove north from Bentonville, Arkansas, cutting through the southwest corner of Missouri into Kansas, I had intended to stop for the night at Fort Scott, Kansas, but then, along the highway—I am so glad that for once I took the highway—I saw one of those brown clay earth colored signs for points of interest that read: George Washington Carver National Monument. This required only the briefest moment of thought; I took the next exit. And immediately regretted my decision. For three miles, the road ahead of me looked like I was driving along the back of one of those Chinese Dragon figures that are in a multiple S-curve formation, each higher than the last, and all I could see was the next several crests rising up before me, one after the other. It felt like a one direction roller coaster for three miles. Have I mentioned I get motion sick? This was not a happy road. But at the end of it, my hero was waiting, a man who was himself a testament to patience and perseverance. Shortly after college, my best friend and I got really into this book about George Washington Carver’s life and work, so this was particularly special for me! 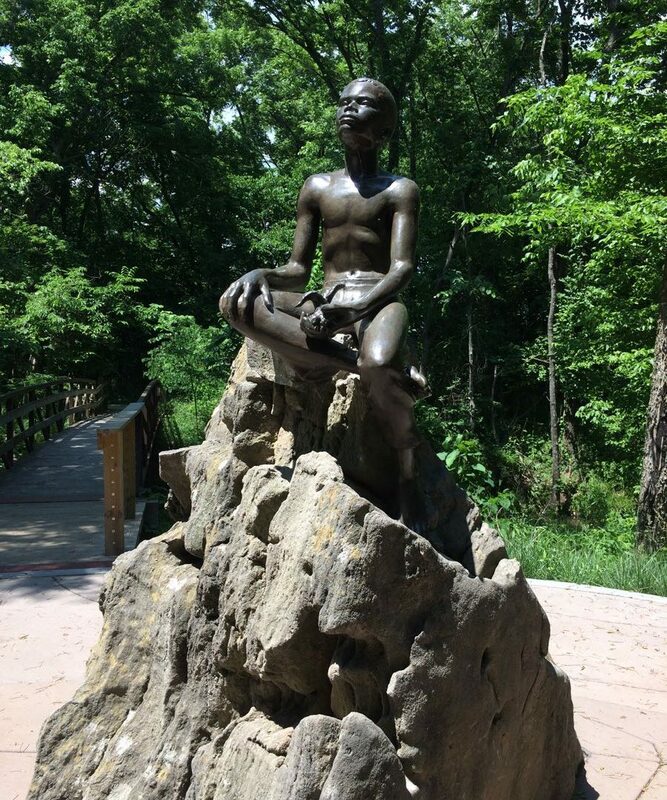 George Washington Carver was born on a farm in Diamond, MO, which is why his memorial is here, at his birthplace, erected shortly after his death in 1943. The memorial site is very well done; frankly, much better than I expected. There were of course exhibits detailing the timeline of his life and describing his work, with pictures and original objects of his where possible, as well as interactive recreations of his laboratory at Tuskegee and one of his first schoolrooms as a boy, a video about his life, and a one mile walking tour to visit the remains of the cabin where he was born, Moses Carver’s house, and the statue of him as a boy that is in the picture at the top. I learned a lot about this man who so impressed me fifteen years ago. For example, I knew that he had found a way to make paints out of one of the byproducts of oil refining, but I hadn’t known that he was such a good artist himself. 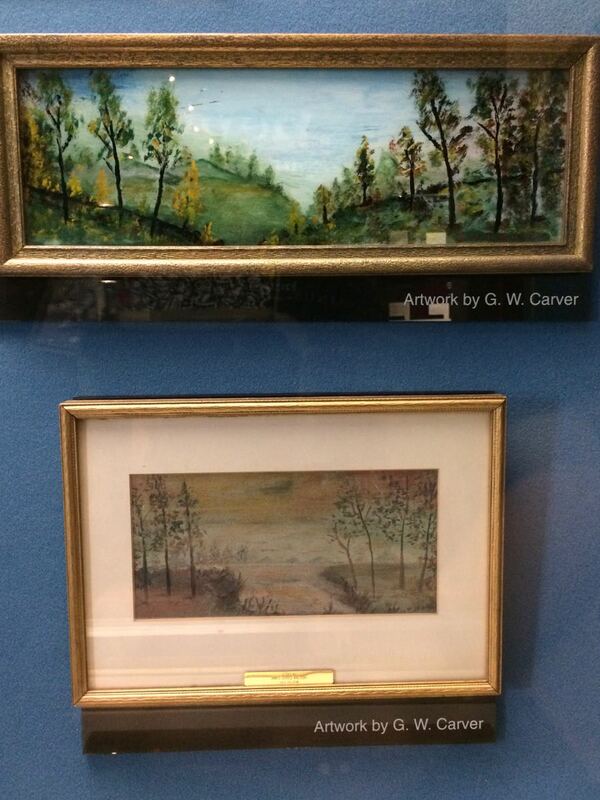 Several of his original paintings were on display, and they were very good. Apparently, he first majored in art at college, but his art teacher feared for his ability to earn a living as a black artist and encouraged him to study his other passion, science, instead. He was also quite an accomplished musician, having learned to play the violin as a young boy. George’s musical talents included a clear soprano voice and the ability to play the organ, piano, accordion, and violin. 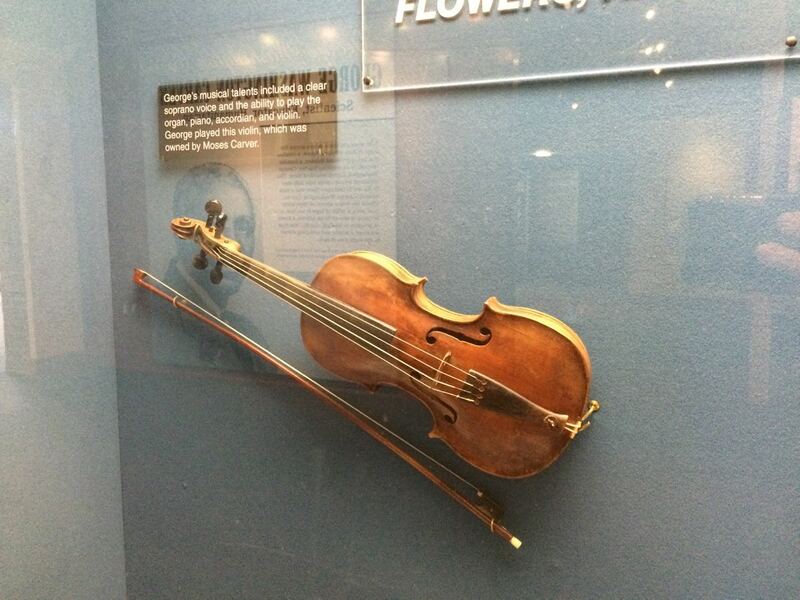 George played this violin, which was owned by Moses Carver. 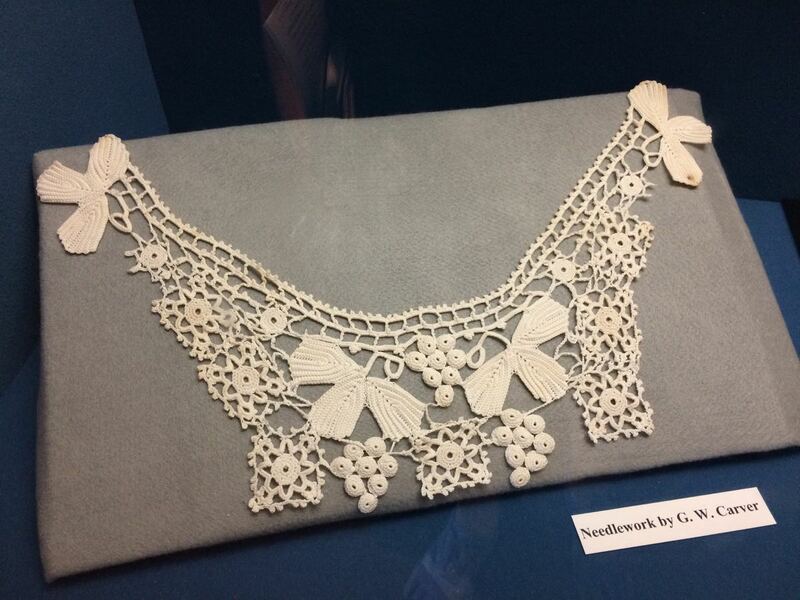 The exhibit explained that since he was a sickly child, he was excused from the hard manual labor of the farm and instead helped the women around the house, which is where he learned crochet and needlepoint. 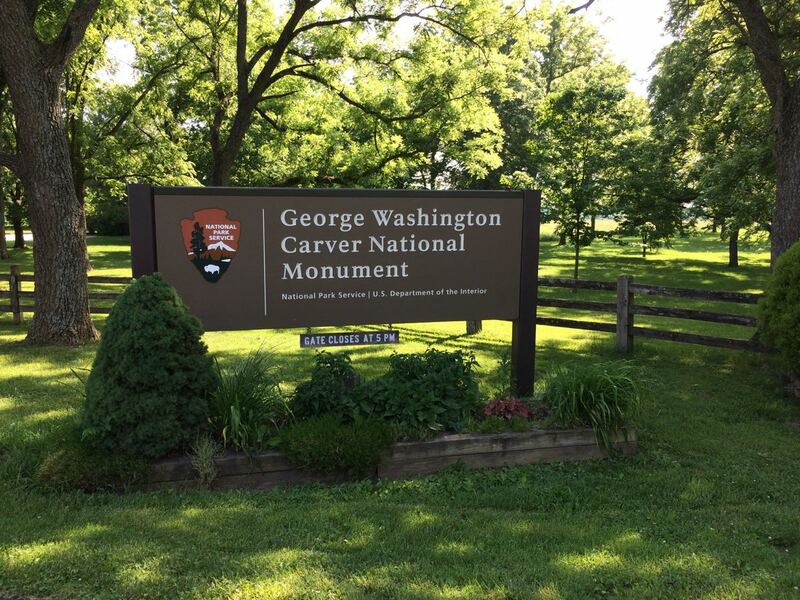 Moses Carver sent an army officer after them, but only George was recovered, nearly dead from whooping cough. This early kidnapping and orphaning left a deep wound that haunted him for the rest of his life. Remnants of the cabin where G. W. Carver was born and would have grown up if his mother had lived. 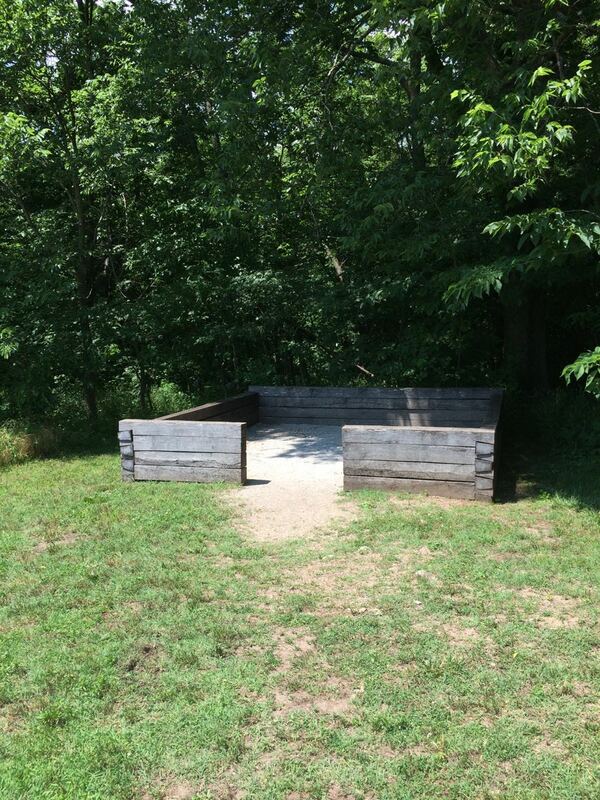 It was about 10′ square. With his mother gone, and his father either dead or unknown—accounts differ—Moses and Susan Carver took George and his older brother into their home and raised them. Though he was well cared for, and maintained a good relationship with the Carvers his entire life, he always felt the sting of being an orphan, and that drove him to make a mark on the world that would justify his life. He was an inquisitive child, and his former master, Moses Carver, taught him to read and encouraged him to learn, though he only had two books around the house, so the educational opportunities at home were limited. With Moses Carver’s support, he left home at eleven to move in with a family in the nearest town where he could go to school, and a year later he moved to Kansas to attend a better school for black children, and continued this pattern several times of moving to seek out better education, supporting himself by taking in laundry and living extremely frugally. He learned well and was accepted to college, only to arrive and be turned away on sight because of his race. He was eventually accepted to Simpson College in Iowa as an art major, where he was the only black student, and a year later transferred to Iowa State Agricultural College, where he earned a bachelor of Agriculture degree in 1894 and a Masters of Agriculture degree in 1896. That year, Booker T. Washington asked George W. Carver to head the new Agriculture Department at Tuskegee Institute in Alabama, a position that changed his life and led to opportunities that we all benefit from on a daily basis, both through the results of his scientific research and his work to further understanding between whites and blacks in those difficult decades following the Civil War. At the close of the film about his life, a recording was played of Carver speaking late in his life. Among other poignant quotes, he said “There is nothing more destructive to development than ignorance. And ignorance is simply ‘I don’t know. '” I don’t know if he intended this specifically in reference to what we usually think of as academic learning—scientific progress—or to the relations between people and races, but I think it applies well to both. I think that most of the root of prejudice, bigotry, and even hatred, is usually a fear of the “other,” a fear of something or someone different from us, and that fear is best put to rest by getting to know the other, seeing that the other is not so different from us after all, and learning to understand the differences that are there, so that they are not so scary anymore. As I was chatting with the ranger about that old book I had loved, he pointed out that they have three different videos about Carver’s life. He said they used to show them all, but got too many complaints that two of the videos harped too much on race relations, on the prejudices he encountered and the trials he had to overcome. As a black man in the late 1800s and early 1900. I didn’t see those two videos, but of course they harped on it. It was a constant aspect of his life. No matter how famous and respected he became, he never could get away from that basic and undeniable fact of his skin color, and because enough other people couldn’t see anything but his skin color, he was constantly constrained by it. He was invited several times to speak in New York City as the keynote speaker for conferences held in fancy hotels, and the conference organizers arranged for him to have first class train tickets and nice accommodations, but upon arriving at the train he was forced to sit in the lowest class car, and at the hotel where he was the invited speaker, he had to eat his meals with the hired help in the kitchen. This determination and genuine humility were critical to his many successes. He taught thousands of students at Tuskegee and created programs to reach out and teach African American farmers throughout the South about innovative farming methods that were within their means. Significant examples were crop rotation and crop diversity, convincing many to plant peanuts and sweet potatoes instead of just cotton, allowing the soil to heal from nutrient depletion and expanding their economic opportunities. Thus he helped free many from the tyranny of king cotton and sharecropping. Sometimes it truly is our own thoughts that hold us back as much or more than physical barriers. This mobile classroom particularly caught my attention. 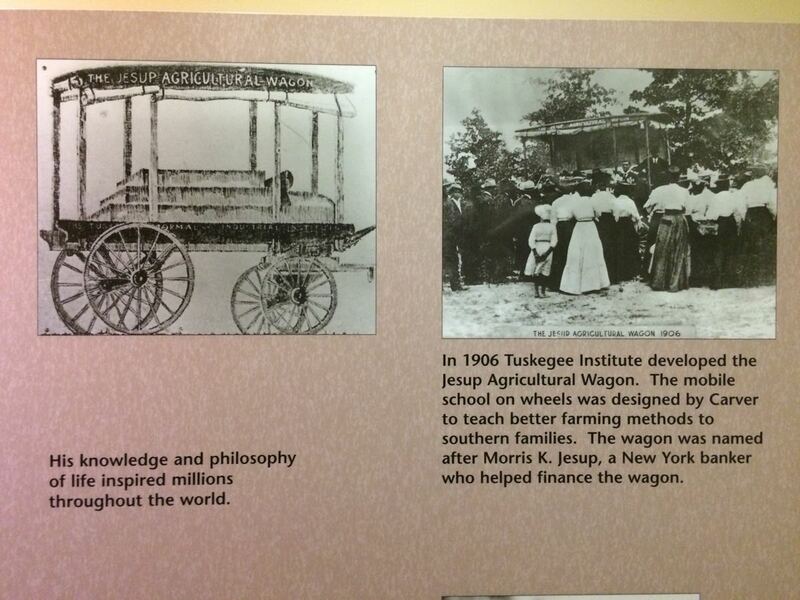 He converted a horse drawn cart to travel around the South, teaching “best practices” to local farmers. Some of his teachings reached far beyond the South, influencing farmers throughout the country and around the world. He also impressed a US Congress House committee in 1921 with his intelligence, wit, and rhetorical skill, as they debated a potential peanut tariff bill that would have negatively impacted US farmers. George W. Carver passed away in 1943 at the age of 78 from complications from a bad fall down a flight of stairs. On his grave was written, He could have added fortune to fame, but caring for neither, he found happiness and honor in being helpful to the world. I am on this journey to find my true self. And that search treads a thin line between thinking too much about myself, and sacrificing myself for the sake of unhealthy expectations. Going too far in either direction does indeed result in a terrible “I” disease. It is the narrow path in the middle I am striving for. Uncovering the pure being that God formed and marked as His Own. 14,174 Miles • I Survived Tuttle Lake—What Did You Do Last Night? Next Post 14,174 Miles • I Survived Tuttle Lake—What Did You Do Last Night?